Prague (Czech: Praha) is the capital and largest city of the Czech Republic. Nicknames for Prague have included: Praga mater urbium/Praha matka měst ("Prague – Mother of Cities") in Latin/Czech, Stověžatá Praha ("City of a Hundred Spires") in Czech and Zlaté město/Goldene Stadt ("Golden City") in Czech/German. Situated on the Vltava River in central Bohemia, Prague has been the political, cultural and economic centre of the Czech state for more than 1,100 years. 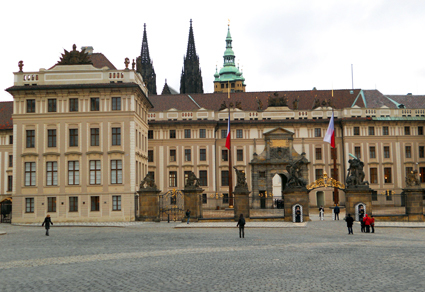 For many decades during the Gothic and Renaissance eras, Prague was the permanent seat of two Holy Roman Emperors and thus was also the capital of the Holy Roman Empire. The city proper is home to about 1.3 million people, while its metropolitan area is estimated to have a population of over 1.9 million. Since 1992, the extensive historic centre of Prague has been included in the UNESCO list of World Heritage Sites, making the city one of the most popular tourist destinations in Europe, receiving more than 4.1 million international visitors annually, as of 2009. The history of Prague spans thousands of years, during which time the city grew from a castle known as Vyšehrad to the multicultural capital of a modern European state, the Czech Republic. Discover Prague, the Czech Republic and the surrounding country with Google Earth, a FREE satellite photo program for Windows which lets you zoom right in from a view of the whole planet, often to as close as a single house just with a simple click of a mouse.